According to a recent research conducted under Professor Nilesh Samani of the University of Leicester, shorter people are at a higher risk of suffering from coronary heart sickness. The researchers explained that the risk of getting affected by coronary heart ailment is influenced by every 2.5 inches modification in the height. The percentage of this change of height on the risk is 13.5%. 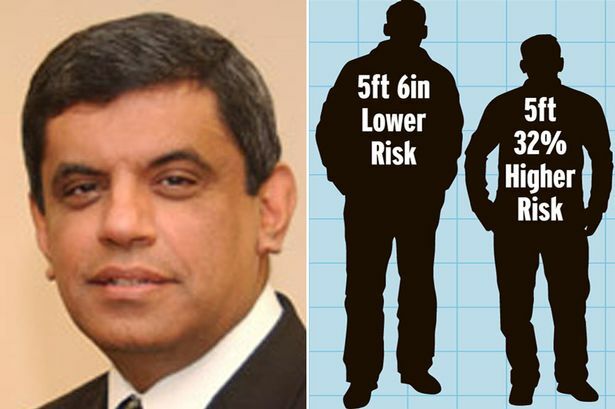 Researchers explained that a 5 foot tall human being will have approximately 32% greater chances of getting coronary heart ailment, in comparison to the person with a height of 5ft 6inch. This is because of their comparatively shorter body structure. The research which is published in New England Journal of Medicine, says that it has been known for over six decades that the height of a person and risk of such diseases have an inverse kind of relation. However, according to Professor Nilesh Samani, it is still not known whether the inverse scenario exists due to co-founding factors or not. Such factors include nutrition, socio-economic conditions, and others. It may be possible that this inverse relation exists because of primary relation that exists between coronary heart illnesses and shorter height. Professor explains that height is a factor that is useful in strong genetic determination. In past few years, a range of genetic variants have been identified in the human DNA, and these can determine the height of a person. He also adds that this is the beauty of DNA. It is singular, unique and remains unaffected by socio-economic scenarios or someone’s lifestyle. The latest research says that while a range of lifestyle factors like drinking and smoking can affect heart ailments, but the findings reinforce the fact that major causes of these most common diseases are complex. There are a lot of other significant factors that are not considered properly by us, according to the research.